When people ask me what I do for a living, I usually hesitate before answering. Writer? 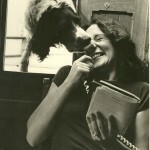 Journalist? Chef? Cook? Teacher? Story teller? 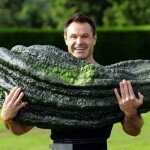 Food advocate? Environmentalist? All of those descriptives are true for me, as they are for so many of us. 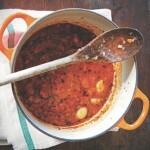 Food can’t be separated from its source and what happens to it on its way to our plates. 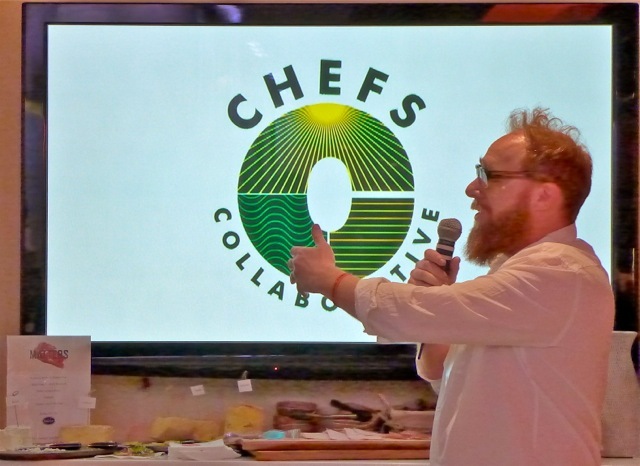 Chefs Collaborative, a nonprofit that educates about a better food system and celebrates the best in American cooking, is made up of hundreds of chefs, cooks, growers, farmers, fisher people, ranchers, cheese makers, artisans, writers, reporters, publishers, educators, activists — and it’s a mighty brain trust. 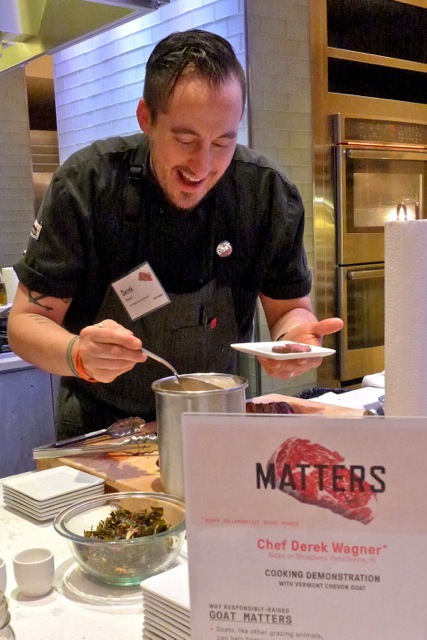 Its latest gathering, “MeatMatters,” a fundraiser at the Food Network Kitchen in NYC about producing and eating meat, was an extravaganza — demos, tastings, and live lessons presented by a stellar collection of chefs and experts from around the country. Between bites, it gave everyone food for fodder. Wish you were there. Chef Rick Bayless of Chicago’s Frontera, Xoco, and Topolobambo (reputedly President Obama’s favorite restaurant) fires up the crowd. 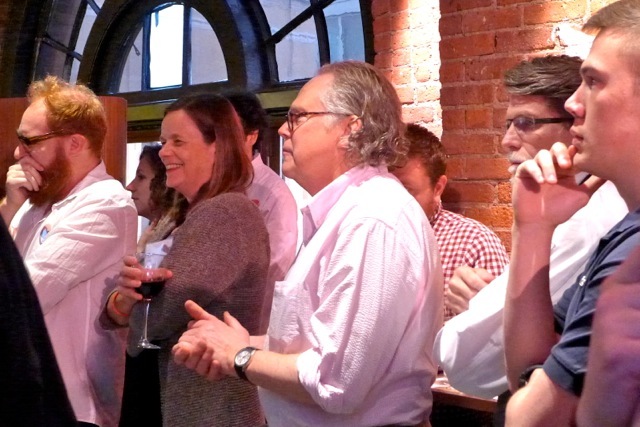 “Sell sustainable on your menus through its deliciousness — it’s all about how the food tastes,” he told the gathering. 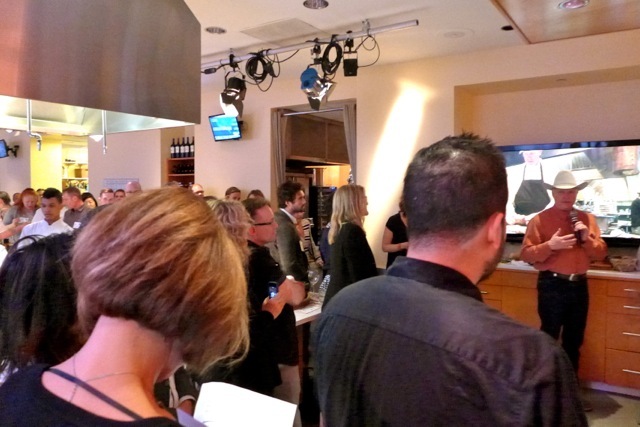 At the Food Network Kitchen, Sara Brito, Executive Director of Chefs Collaborative, brings together authors, journalists, media people, and shakers in the food world for a briefing before the party. 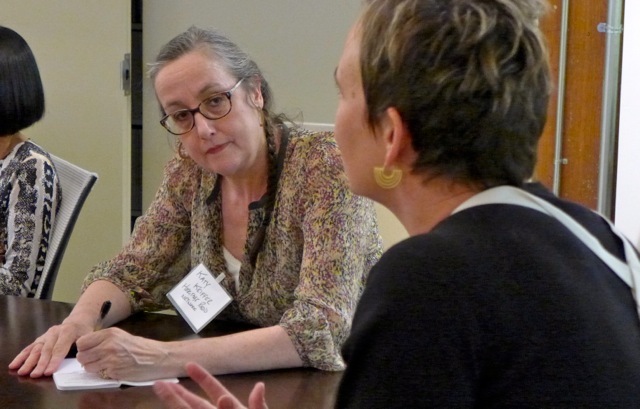 Left, Kathy Keiffer of Heritage Radio Network, right, Piper Davis of Grand Central Bakery, Seattle. This crowd doesn’t sit for long. Preliminaries over quickly and it’s on to the chef stations for tastings of what they have prepared with a little help from Food Network Kitchen staff. 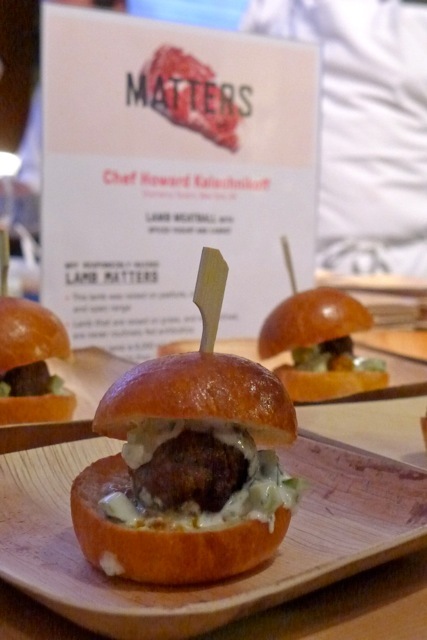 Lamb meatballs with spiced yogurt and carrot made by Chef Howard Kalachnikoff of NYC’s Gramercy Tavern. 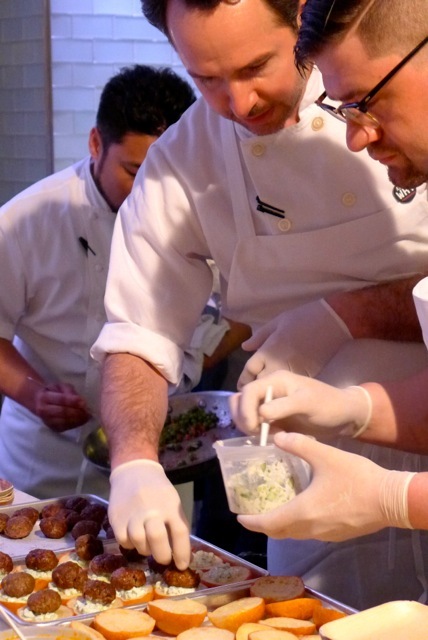 The Gramercy Tavern team assembling the delicious meatball sliders. Journalist and New York Times best-selling author Michael Moss who won a Pulitzer Prize for his investigation of the dangers of contaminated meat, working the line. Journalist Michael Moss going for the fried chicken. 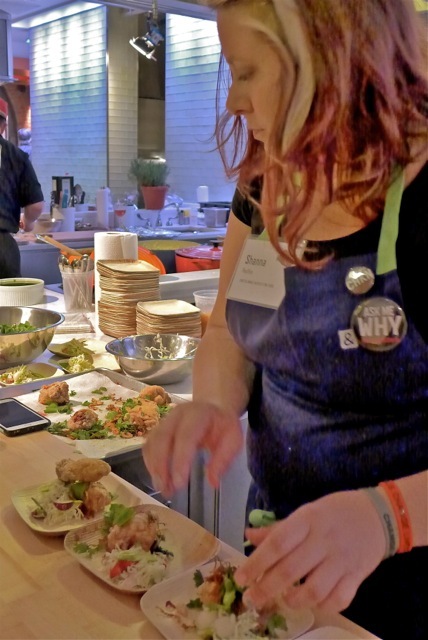 Chef Shanna Pacifico, NYC, Chefs Collaborative Scholarship recipient, serving up her fantastic chicharone de pollo with spring vegetable slaw. 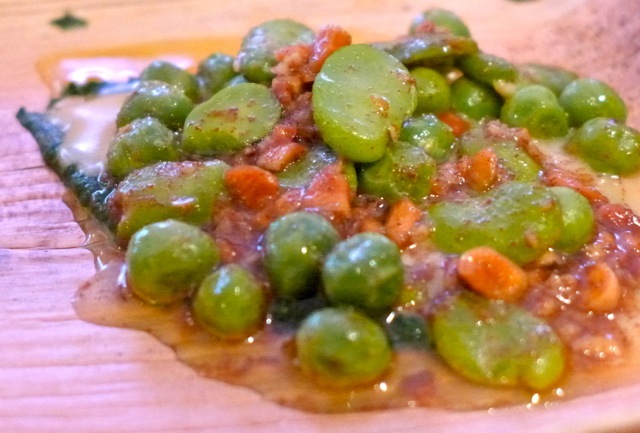 Michelin star Chef Bill Telepan of Telepan NYC flipping favas. Considering he pioneered WITS, Wellness In The Schools, promoting healthy eating, environmental awareness and fitness as a way of life for kids in public schools, it’s not surprising he wants you to eat your vegetables..
Telepan’s peas and fava beans with nettles and almonds — one of the most luscious dishes I ever ate (that’s saying a lot!). 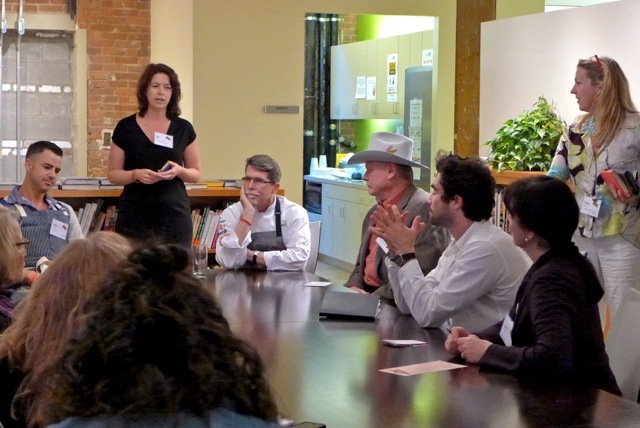 It was about learning from leading change-makers in the culinary world as much as eating great food. 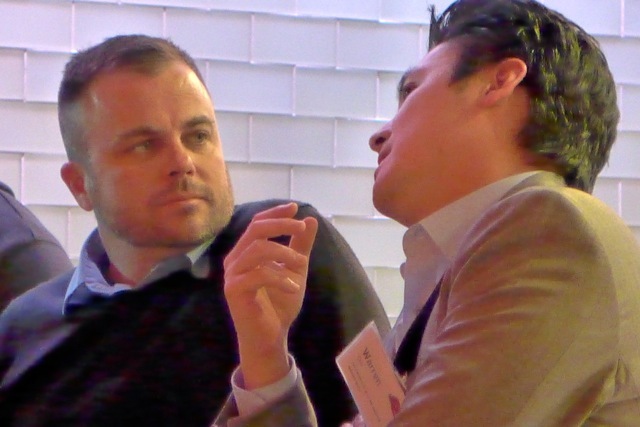 People stop at individual stations to talk to them. 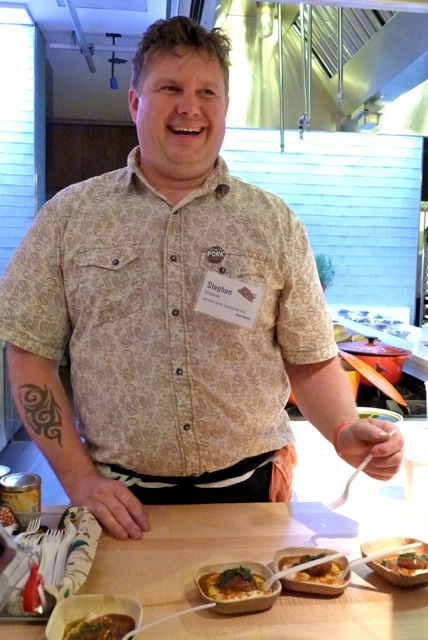 Chef Stephen Stryjewski of Cochon, Cochon Butcher, Peche, New Orleans, serves up blissful stone ground smoked grits with braised pork cheeks, onion gravy, and crushed herbs. 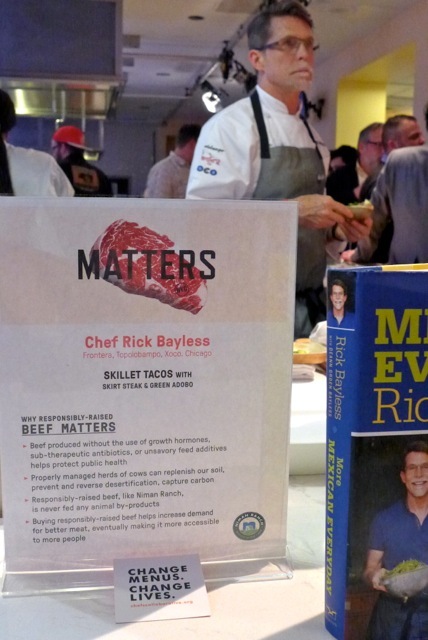 Chicago’s legendary restauranteur Rick Bayless, known for his traditional and innovative Mexican food, raises awareness about sustainable meats through his advocacy work, and on his menus. 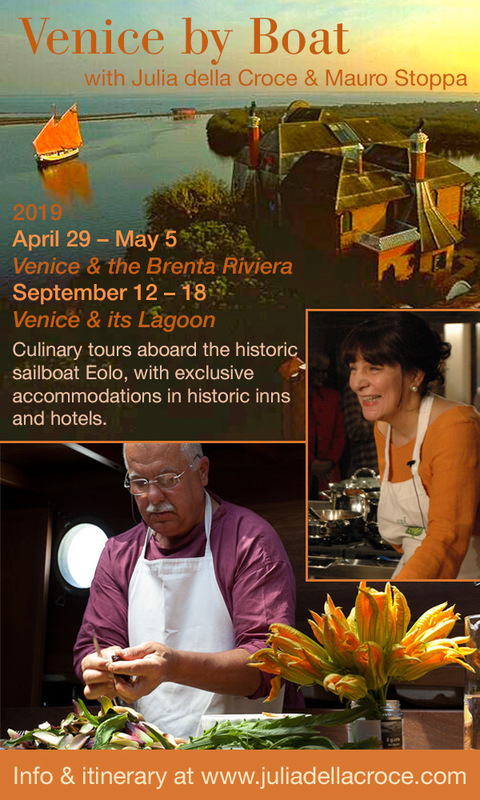 He carefully sources all the ingredients he uses, and has some of it, such as corn, produced especially for his restaurants. Because all conventional maize from the U.S. and Mexico alike is GMO, he hires local farmers to produce crops without genetically modified seeds for his restaurants. His soft skillet tacos with skirt steak, green adobo, and fresh lime, are a revelation about Mexican food. 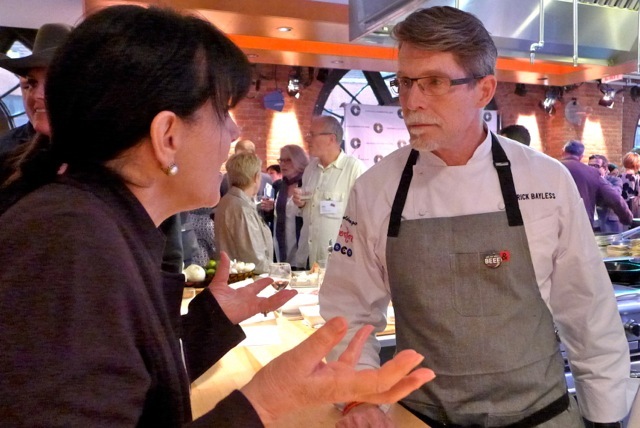 Talking about the GMO and corn with Rick Bayless. 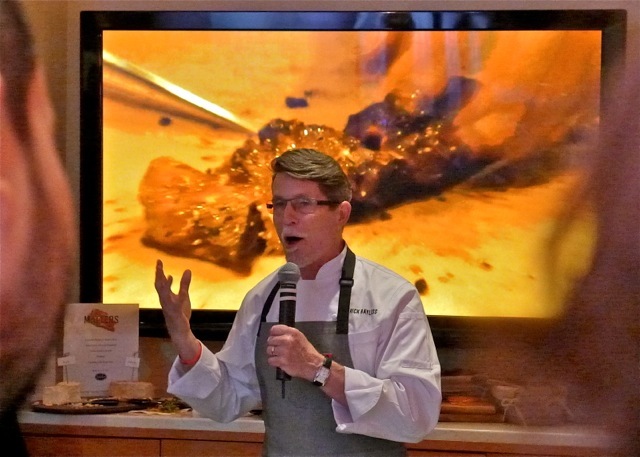 Some beef pointers from Chef Rick Bayless. Pastry chef Piper Davis offered rhubarb tart with a flaky leaf lard crust topped with whipping cream topped and fresh strawberry. 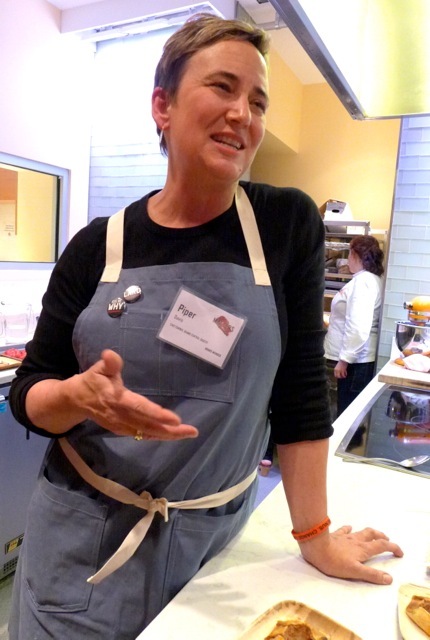 She talks about how her thinking evolved about using lard and whole grains in baking. As hands-on as it gets. Adam Danforth butchers a goat at MeatMatters while a fascinated audience observes. 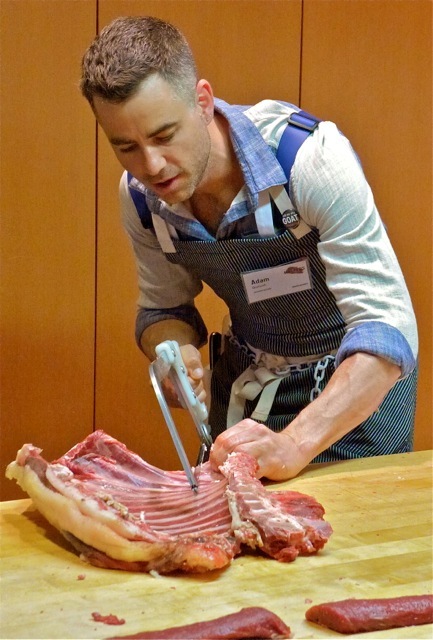 Chef Derek Wagner of Nick’s on Broadway, Providence RI, gives a cooking demonstration using the butchered goat. 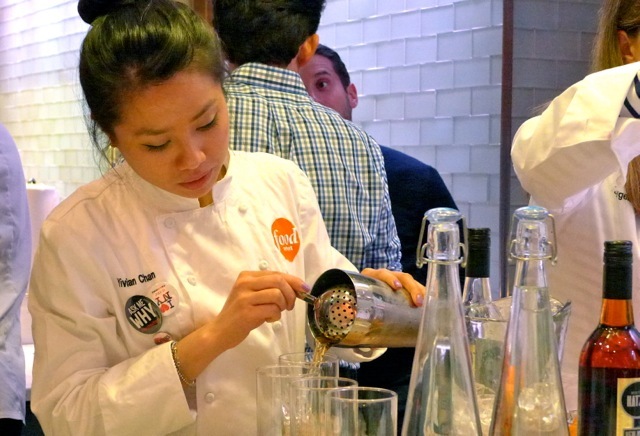 Not surprisingly, people in the food business are serious partiers. 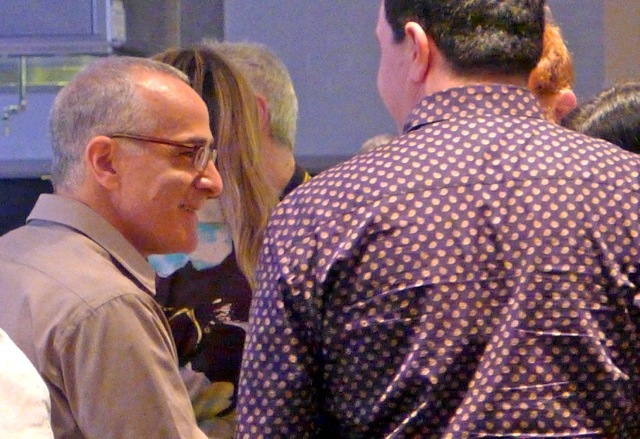 The bash is also a great opportunity for discussing the issues with like-minded people who are at once doing important work and creating delicious food. Food Network Kitchen mixologist offering drinks and cocktails using local wines and spirits. 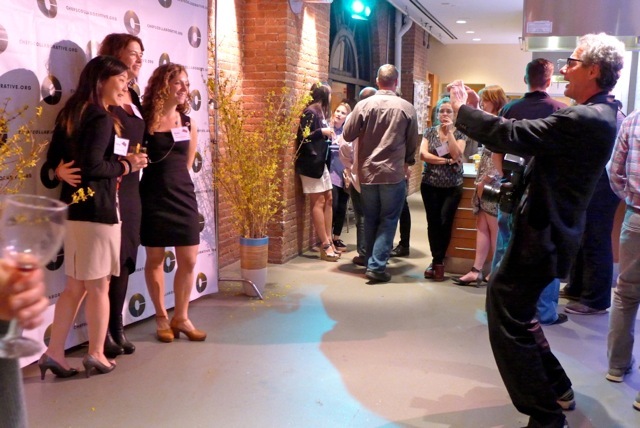 Photo op for Chefs Collaborative’s Christine Kim, Sara Brito, and Alisha Fowler. 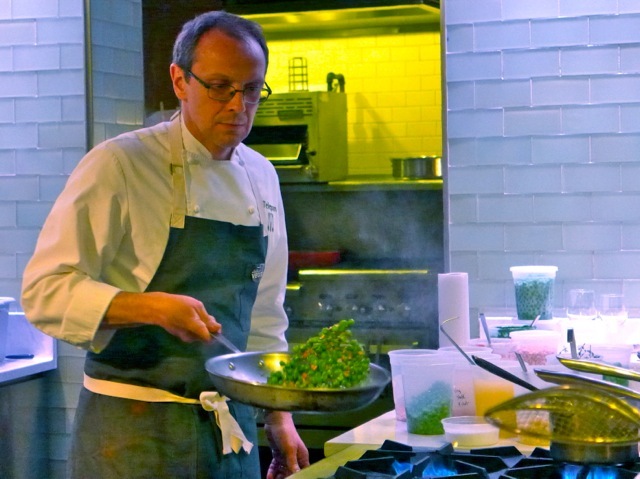 Seen: Chef Peter Hoffman, farm-to-table pioneer of Back Forty and Back Forty West, NYC. “Best Chef” James Beard Award winner and Chef Collaborative board member Evan Mallet of Black Trumpet, New Hampshire, with the Collaborative’s program director, Alisha Fowler. Left, Kelly Whittaker of Denver’s Basta and Cart Driver, nominated one of America’s Best Chefs by his peers. 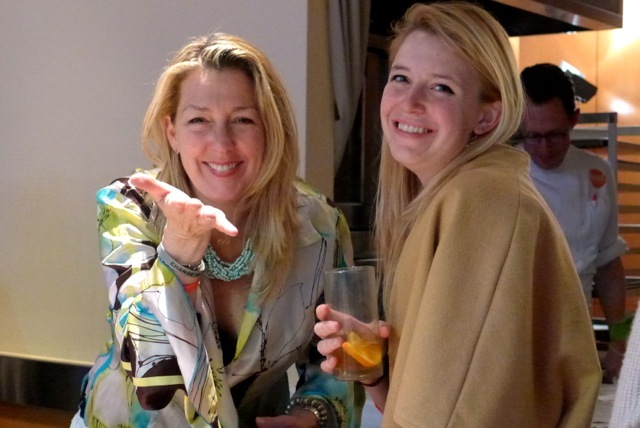 Chefs Collaborative Board member, Colorado farmer, natural food advocate and mover Sylvia Tawse, left, with Erin Bates from Basta and Cart-Driver in Denver. 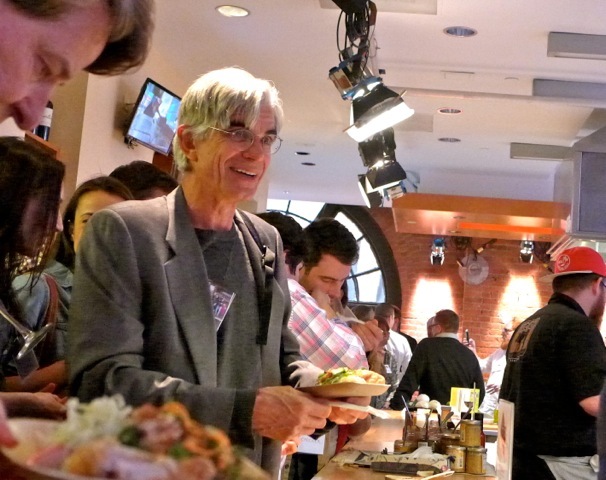 “You must get people to think about where their meat comes from,” Rick Bayless summarized. 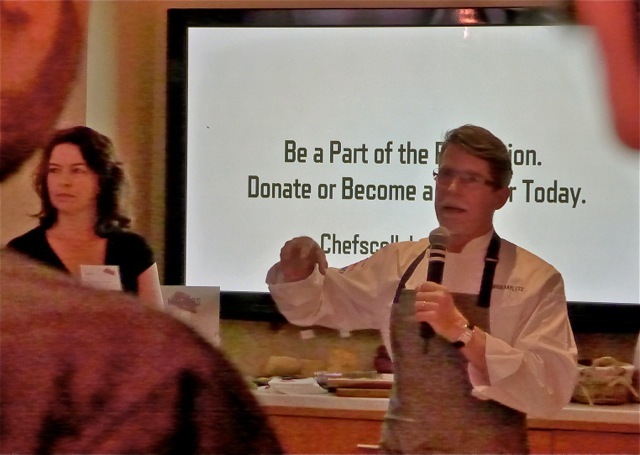 Sara Brito and Rick Bayless getting out the message together. Right, Mel Coleman of Niman Ranch, pioneers in sustainable ranching, talking about how to raise meat responsibly. 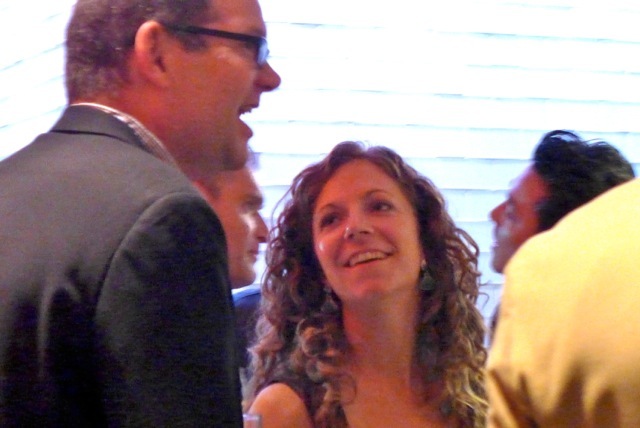 Left, Chef Collaborative’s current president Matt Weingartnen, and Zester Daily publisher Corie Brown. Current Chef Collaborative president, chef, author and activist Matt Weingarten wraps up the evening. Even with all the partying, we are on a serious mission: nothing less than changing the way people eat. 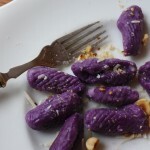 If you missed my broadcast on NPR this time last year about how I came to invent sweet potato gnocchi, tune in today. 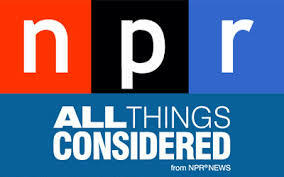 NPR is re-running the show on “All Things Considered,” the “Found Recipe” series, in time for Thanksgiving. 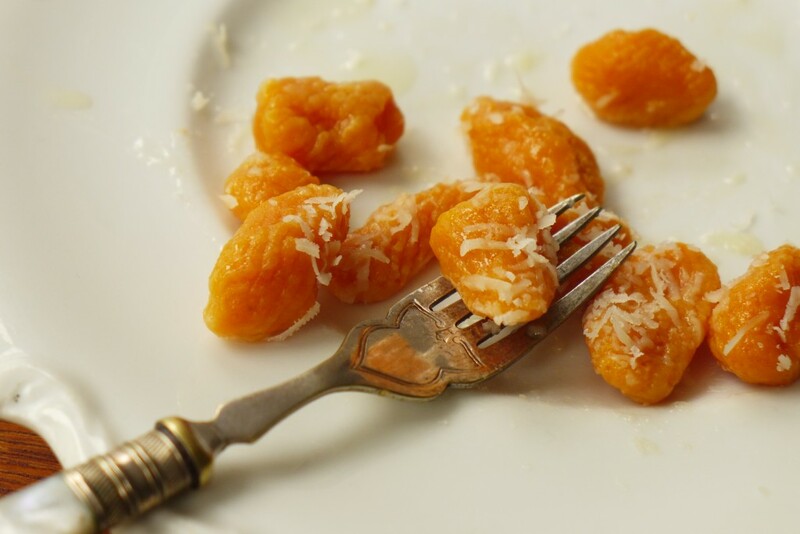 You just may want these little beauties on your holiday table, dressed with sage butter and a veil of grated cheese. 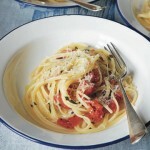 Serve them the way the Italians would, as a first course before the turkey. 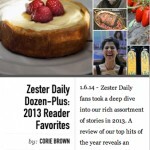 The New York Times Diner’s Journal is a great source for timely information about food and dining.